Washington Democrats this year are fighting hard to win election in state legislative districts where the party hasn’t scored victories — or in some cases, even fielded candidates — in many years. 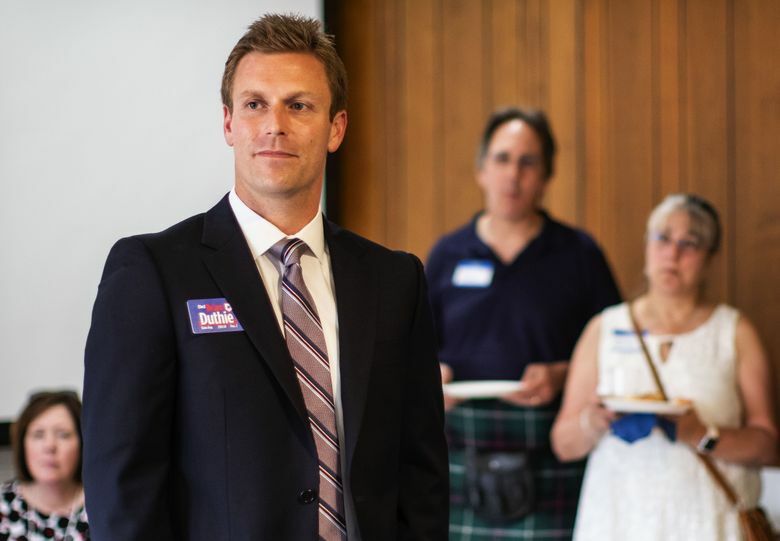 PUYALLUP — It’s his official campaign kickoff in Washington’s 25th Legislative District, and Democrat Brian Duthie has already learned to pepper his stump speech with a critique of Seattle. Duthie, a military veteran and Everett firefighter who lives in Puyallup, was calling for a more regionalized approach to issues such as mental health, substance abuse and housing, and was criticizing Seattle’s response to its homelessness crisis. “Seattle has provided us with a great opportunity of what not to do,” Duthie, 35, told dozens of supporters at last week’s event. Duthie’s attempt to distance himself from Seattle — which has become an emblem for the GOP of everything that’s wrong with Democratic policies — comes as he tries to win in a district that lately has elected Republicans by double-digit margins. He’s part of a slate of Democrats this year fighting hard in places where the party hasn’t won — or in some cases, fielded candidates — in years. Republican officials, for their part, say they aren’t worried about candidates like Duthie, or other challengers running in even more conservative districts that have had reliable GOP winning streaks. Although it’s early, some of these Democratic candidates have been campaigning for months, with Duthie and a handful of other challengers so far raising more money than their GOP opponents. The 2018 election has been focused at the national level, where Democrats and Republicans are waging a high-stakes battle to control Congress in races being cast as referendums on President Donald Trump. But in Washington state, voters will decide whether Democrats keep their slender state House and Senate majorities, or whether Republicans can peel off enough seats to return to divided government. The balance of power in Olympia affects everything from tax policy and gun regulations to salmon farming and whether taxpayer-funded records should be disclosed to the public. Candidates must officially file this week with the state, but many already have registered with Washington’s Public Disclosure Commission and are submitting fundraising reports. Since becoming chair last year of the Washington State Democratic Party, Tina Podlodowski has vowed to compete with Republicans statewide. The party has launched a series of one-day politics and candidate-training workshops across the state that she says have drawn thousands of people. And state Democrats have opened permanent offices in Yakima and Spokane, to establish a link to those communities that organizers can also use as a base. 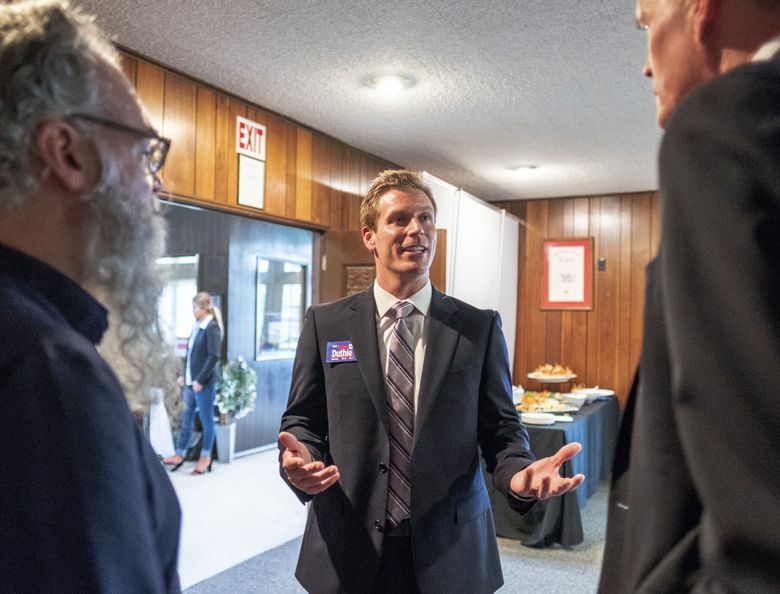 It’s an effort designed not just to compete in more districts, Podlodowski said, but to build a pipeline of potential candidates for all types of races in the future. Regaining that ground won’t be easy. Democrats have lost seats over the years on the Olympic Peninsula and in Southwest Washington, where Trump in 2016 flipped some traditionally Democratic areas. In Grays Harbor, Trump won a county that hadn’t voted Republican in a presidential race since 1928. The only Democratic lawmakers found east of the Cascade Mountains are from the 3rd Legislative District, which represents the central part of Spokane. Meanwhile, GOP legislative candidates have managed to win races despite being outspent, said Caleb Heimlich, chairman of the Washington State Republican Party. Democratic legislative candidates appear set to run up and down the Interstate 5 corridor and east of the Cascades, into the Okanogan Highlands and on to the Palouse. Republican Rep. Bruce Chandler, of Granger, Yakima County, last faced a Democrat on a general election ballot in 2010. GOP Reps. Ed Orcutt, of Kalama, Cowlitz County, and Joe Schmick, of Colfax, Whitman County, haven’t seen Democratic challengers since 2008. The last time Rep. Joel Kretz, R-Wauconda, in Okanogan County, faced a Democrat, George W. Bush secured his 2004 re-election for president. This year, all four look like they will have Democratic challengers, according to campaign-finance records. As of last week, Schmick has even been outraised by his opponent. Meanwhile the recent retirement by Rep. Cary Condotta, R-Wenatchee, comes as a moderate independent candidate, Ann Diamond, has raised $51,000 in that race. In the 20th District, a chunk of Southwest Washington that includes parts of Clark, Cowlitz, Lewis and Thurston counties, Democrat Brennan Bailey is running against Orcutt. “I really wanted to light a fire under him, and just show him that there are people out there who want action,” said Bailey, a 28-year-old Chehalis resident who has served on the Chehalis School Board, and is now finishing a Harvard master’s degree program. Orcutt, the ranking Republican on the House Transportation Committee, ran unopposed in 2010 and 2016, and handily beat Republican challengers in 2012 and 2014. He didn’t respond to requests for comment. Heimlich said he’s “very comfortable” that Republicans will hold seats like Orcutt’s. As for fundraising, Heimlich pointed to Republican state House candidates who were handily outspent in 2016 — but won anyway. And Heimlich argued that Democratic candidates around the state are simply avatars of Gov. Jay Inslee, and Seattle politicians such as socialist Seattle City Councilmember Kshama Sawant and Democratic House Speaker Frank Chopp. He cited the controversy over the Seattle City Council’s proposed head tax and the fact that the state Democratic Party platform calls for a personal income tax. “These things are not the values that people want to see coming out of Olympia,” Heimlich said. Democrats are betting they can turn districts such as the 25th into prime state House battlegrounds. It may not be easy. The district covers a chunk of Pierce County that includes Fife, Midland, Puyallup, South Hill and part of Parkland. Its two GOP representatives — Melanie Stambaugh and Joyce McDonald — are among about a dozen lawmakers retiring this year. In 2016, voters here broke for Trump and GOP gubernatorial candidate Bill Bryant, while also supporting Democratic U.S. Sen. Patty Murray. But Republicans in 2014 and 2016 easily bested Democrats here in state legislative races. This year, Duthie is expected to face Republican opponent Chris Gildon, another military veteran. In an interview, Gildon described his tours of duty in Afghanistan helping to negotiate peace with insurgents and said he wants to bring a less-partisan perspective to Olympia. “I really want to protect our quality of life,” said Gildon, a 46-year-old Puyallup resident. Republicans, meanwhile, are talking up their challengers against a couple of Democratic incumbents in rural and suburban areas, like Rep. Brian Blake, of Aberdeen, and Rep. John Lovick, of Mill Creek, Snohomish County. But Blake in recent years has comfortably won his Southwest Washington seat, and is considered one of the most conservative Democrats in the state. Lovick in 2016 defeated his Republican challenger by about four points. It remains to be seen if all these Democratic candidates will file to run — and whether those who do can really compete in areas now held by Republicans. But Podlodowski, the Democratic Party chair, envisions a campaign operation of up to 50 teams of doorbellers every weekend across the state, as well as phone-banking and more activist training. “We’re really turning this into a very aggressive campaign machine in Washington,” she said.